"Ina's Way" begins at the bridge between Privlaka and Mirkovci and leads to Djeletovci. It is 29.5 kilometres long and the entire road is paved. Sveti Martin na Muri, a 35 kilometre long trail with asphalt and gravel surface extends from the Spa Resort Sveti Martin to Pleskovac. Tartufina is a 35 kilometre trail with asphalt and gravel surface, and extends from Buzet via picturesque Istrian countryside to Senj and Mala Huba. Casanova trail begins in Vrsar, and its 23 kilometres extend on asphalt and gravel surface across Funtana and the Lim Channel to Maras. Route Grobnik - Novi Vinodolski is 55 kilometres long, and although it is asphalted all the way, its demand factor is 4/5, therefore it is recommended only to experienced cyclists. Somewhat easier is the 27 kilometre trail Rijecine - Grobnik which starts in Drazice, and which is partly paved and partly gravel. Route Gornja Banda to Cavtat has its beginning and end in Cavtat. It is made of gravel and asphalt, and it is 26 kilometres long. Wine roads starting in Novalja are only 4 kilometres long, but they have a very sharp rise along the gravel road and off road, and they require great stamina. From Stara Novalja to the Beach Zrce and Caska a 10.5 kilometre gravel route Kamenolom stretches. One of the shortest is Kolan, a 2.5 kilometre gravel road ride, which can get you to Pag and Novalja. 1246 is the number of islands that stretch along the 1777 kilometres of the Croatian coast. This information is interesting, but is has even greater meaning if you ever decide to dive into the crystal depths of the Adriatic Sea. 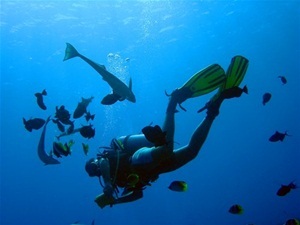 Diving as a recreational sport is fairly new in Croatia. However, in a short time it has become extremely popular, which is not surprising if we think of all the secrets and beauties that the Adriatic Sea hides. You can dive at over 100 different locations, each of which has something unique on it. They can be caves Male Srakane near the island Losinj, the archaeological finding Savudrija near Umag with its amphorae, or Raznjic near Korcula, which stands out for the beauty of its diverse flora and fauna. Or you can simply choose to engage in an adventure of night diving that you can experience around the island Krapanj, the smallest and the most inhabited Croatian island situated between Sibenik and Primosten. You can visit the sunken ship Baron Gautsch near Rovinj, Obelisk Kampanel near Hvar which was proclaimed one of the most beautiful in the world, or the inevitable ship wreck Kaiser Franz Joseph in the vicinity of Dubrovnik. Descending in a small rubber boat down rapids of the rivers Dobra, Cetina, Zrmanja, Kupa or Una is not for people of weak nerves. Rafting on the river Zrmanja is extremely interesting in fall. Besides rafting, it is possible to walk enjoying the beautiful scenery, and to swim. The river Una stretches from Kutina via Zagreb and Karlovac to Gospic. 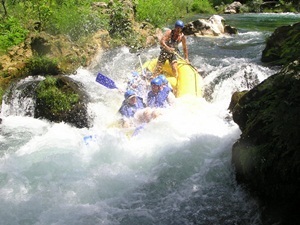 As it is not too "wild", rafting on the Una is recommended to families with children. If you choose to spend your vacation in one of the apartments in Karlovac, take a ride to Generalski Stol and try out rafting on the falls of the Mreznica. Besides the ones mentioned, those who need some adrenaline should try the Kupa in Gorski Kotar, the Cetina River, which is obligatory if you visit Makarska, Brela or Omis. At 70 kilometres from Zagreb a rafting adventure begins on the Dobra, whose name means "good", but which is not that good-natured and is considered one of the most demanding rivers. We must not forget the Sava River which has a fairly peaceful stream in Slavonia, but near Samobor it turns into a bundle of not too dangerous rapids – which makes it an ideal destination for a family adventure. In recent years, mountain climbing has become an obligatory part of an active holiday. Hiking in the nature has been replaced by adrenaline adventure of steep slope climbing. Because of the great number of national parks and natural beauties, Croatia has been an attractive destination for amateur and experienced mountaineers. 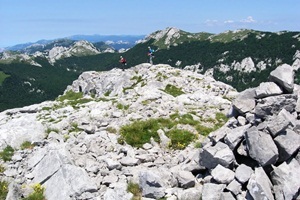 Near Otocac and Senj there is Northern Velebit National Park, with hiking trail Premuzic. From the top of it there is a view of the islands of Krk, Rab, Pag and Prvic. If you choose to spend your vacation in one of the apartments in Rijeka, Delnice or Lokve, you will be able to hike in National Park Risnjak, which has a fairly mild slope all the way to Medvjedja Vrata, where the steep part begins. In Istria, Ucka is situated, with its highest point being a 100-year-old lookout from which the view extends to Rijeka, Opatija and Lupoglav. Some other popular hiking destinations in Croatia are the Mountain Biokovo which extends along the Dalmatian coast, National Park Plitvice Lakes, and Paklenica near Starigrad-Paklenica. Although Croatia is not rich with ski resorts, is a very popular destination for skiing. Above all, skiing owes its popularity to the affordable private accommodation facilities in mountainous and continental Croatia. 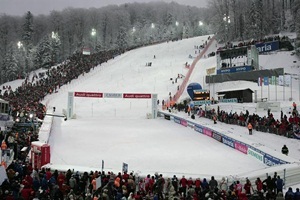 Also, there is the world famous Snow Queen ski contest, which has taken place on Sljeme near the Croatian capital - Zagreb for many years. Sljeme has five ski runs with total length of 4 kilometres, and two anchors and one chair lift leading to them. Another popular skiing resort in Croatia is Begovo Razdolje (1 kilometre track with anchor) near Mrkopalj, half an hour away from Vrbovsko and an hour from Rijeka and Zagreb. There is Bjelolasica near Ogulin. With its six ski runs (5 kilometre trail) it is the largest Croatian ski resort with 6 two-seater chairlifts that take you to the top of it. Another important resort is Platak above the city of Rijeka, between Istria and Gorski Kotar.